WASHINGTON (AP) — A military band played and the White House rolled out the red carpet Thursday for the first official visit in nearly two decades by a Canadian prime minister, a charismatic and youthful liberal leader intent on tight ties with the United States. President Barack Obama greeted Justin Trudeau by emphasizing that their nations are blessed to be neighbors with shared views on the importance of health care as right for all and diversity as a sign of strength. "We see ourselves in each other, guided by the same values," Obama said. At the ornate arrival ceremony on the South Lawn, Obama and first lady Michelle Obama welcomed Trudeau, the 44-year-old son of the late Prime Minister Pierre Trudeau, and his wife, Sophie Gregoire. The leaders found time for some levity before heading into an Oval Office meeting, with a state dinner to come in the evening. The president hit on a topic of national pride for Canadians: hockey. "Where's the Stanley Cup right now?" Obama joked, before answering his own question — the Chicago Blackhawks won it last season. Trudeau tried to match Obama's trash talk, noting that three of the Blackhawks' best players are from Canada. Still, the young prime minister's remarks were largely earnest. He linked his agenda to the Obama administration's and said the two governments "share and are working on the exact same objectives." "There is no relationship in the entire world like the Canada-U.S. relationship," Trudeau said. "We grew up together." Despite that close geographical and political alliance, no Canadian prime minister had made an official visit since 1997, a fact that Obama noted. "It's about time, eh?" Obama said, playing up the American stereotype of a Canadian colloquialism. Canada is the United States' largest trading partner, with more than $2 billion worth of goods and services crossing the border every day. About 75 percent of Canada's exports go to the U.S. Besides trade, the two leaders were expected to seek common ground on environment protection. Before their meeting, the U.S. and Canada said in a statement that they will work to put in place an international agreement in Paris on curbing global warming. They committed to reducing methane emissions by 40 percent to 45 percent from 2012 levels over the coming decade. Methane is the second most prevalent greenhouse gas emitted in the U.S. from human activities and is much more efficient at trapping radiation than carbon dioxide. Trudeau's father swept into power in 1968 and, with a short interruption, served until 1984. He was often compared to President John F. Kennedy and remains one of the few Canadian politicians known in America. Tall and fit, Justin Trudeau channels the charisma of his father. He aims to restore his father's legacy as leader of the Liberal Party, which was under siege during 10 years of Conservative rule under Stephen Harper, Trudeau's predecessor. Harper's relations with Obama were strained over various issues, notably the proposed Keystone XL oil pipeline, which the Obama administration rejected last year. The American ambassador to Canada, Bruce Heyman, could not get a meeting with Harper or his Cabinet ministers for months. 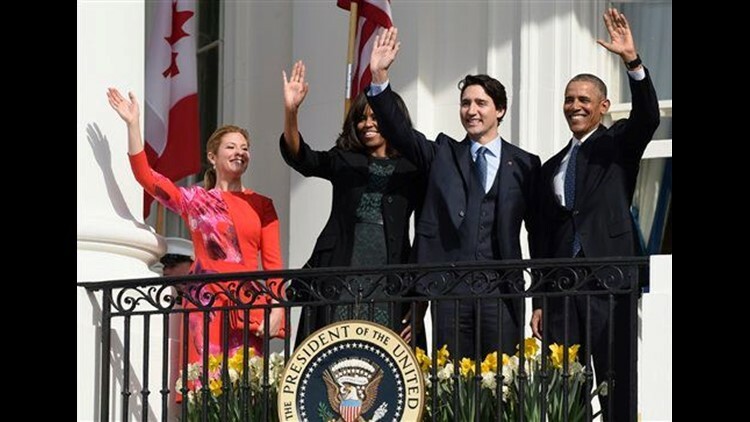 But Trudeau's election in October ushered in a new era for Canada's politics that Trudeau, Heyman and others hope will help strengthen relations with the U.S.
"President Obama has only had nine state dinners, so he only has one or two a year. The fact that Canada is his 10th state dinner is a strong demonstration of the U.S.-Canada relationship and the importance to the president," Heyman said in an interview. "These are two leaders who have very similar goals and philosophies."